Here's another seafood dish with a kick. 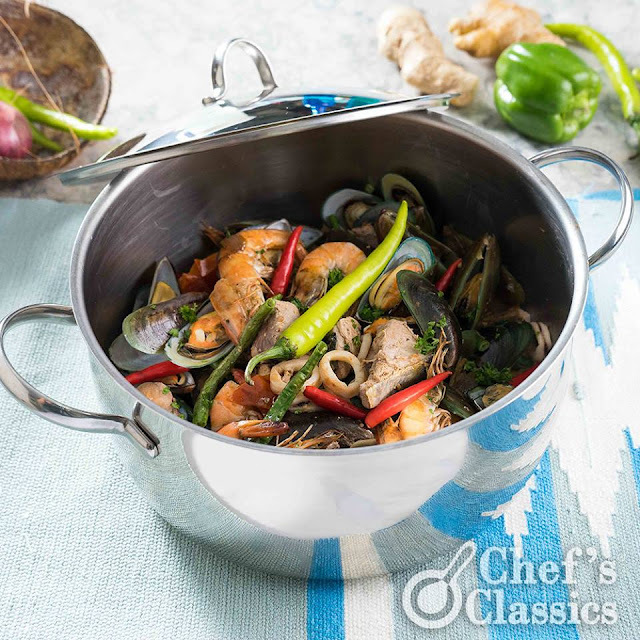 Spice up your meal with our recipe of Seafood Bicol Express! Our favorite seafood in spicy coconut cream? Now, that's comfort food! 1. In a Chef's Classics Red Carnation Casserole, saute onion, ginger, tomatoes and garlic. 2. Add the shrimp paste and let it simmer for at least 2 minutes. Pour in the coconut cream or gata. 3. Season with salt and pepper, fish sauce and chili powder. 4. Add in the clams, string beans and shrimps. 5. Add tuna and squid. Simmer for another 2 minutes, and, voila, it's ready. 6. Best served with steamed rice.